Over the years, people have pinned Windows down as the slowest of all operating systems. While Mac still remains a class product, our beloved Ubuntu Linux has shot to fame because of its amazing speed and power, even on low-end systems. Windows, after months, or sometimes weeks of usage, tends to bloat and behave like a sluggish car beyond repair. Ubuntu on the other hand, tends to stay as agile as it was when you first installed it, making it one of the most preferred operating systems on low-end computer users. That said, grass isn’t always green in the Ubuntu Linux world. As with every operating system, perfection eludes the open-source distribution, thus making issues like slowdown and incompatibility more prominent. These problems, however, cannot be pinned down as Ubuntu’s fault because most of them arise from incompatible hardware, especially graphics cards. So, if you too, in some point in time have faced, or are facing issues of slowdown and choppy graphics, here are some simple tips to help you alleviate those problems and in effect make Ubuntu Linux run faster. About three years ago, when I went to purchase a new graphics card, the vendor recommended me ATI, telling me that it’s much better than the almost-omnipresent NVIDIA, and that I won’t be disappointed by the performance. I couldn’t agree more with him as I too had read a lot about ATI, but never had the chance to try it out. So, I went home with a sparkling grin, installed it, and tried out the latest game that was available out there, and boy, I was thoroughly impressed with it. The card ran as smooth as butter on Windows, but then, once I installed Ubuntu on my computer, that’s where the problems began. Not only did I have a tough time installing the drivers, I also had trouble getting the card to work just enough to play movies. However, sticking to ATI paid off, as graphic support for my card has improved by miles over the last couple of years. Though not as good as it is on Windows, it is still quite satisfactory when you have a lot of RAM. If you ever have faced similar issues in the past, I don't need to tell you how important it is to update your graphics drivers. If upgrading your graphic card doesn’t help alleviate the problem, then it may be good idea to move to something lighter. While XFCE is a perfect desktop for extremely low-end and dated computers, for those stuck with an incompatible or old graphic cards, the Qt-based Unity 2D comes in really handy. The light environment brings the best features of Ubuntu without using too much of your RAM. With the advent of Ubuntu Software Center, the classic-yet-powerful apt has lost its prominence. Though as good as Ubuntu’s new app store is, apt-get is almost ten times faster thus saving you a lot of valuable time that’s usually spent while updating and installing applications. 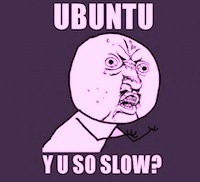 Ubuntu doesn’t bloat like Windows, but having a dozen of start-up applications surely slows it down. To remedy that problem, it’s always a good idea to check which apps you have added to your start-up list. To do so, open the launcher (Super Key/Windows Key) and type in the words ‘startup applications’. Once the ‘Settings’ window opens, chose which applications should load when Ubuntu starts up. Sometimes, especially if you’re a web addict, the browser cache tends to pile up and slow down the computer. A simple solution to this problem is clearing the cache by going to your browser’s settings menu. Why on earth would clearing browser cache speed up your computer?? The files are just lying there, doing nothing. And when you re-enter an URL, they'll make the page load faster, not slower. Anonymous 1, I've fixed every problem imaginable on thousands of computers over the past 20 years. That said, clearing a browser cache that has gotten to be huge will definitely speed up browsing. A smaller cache will speed up pageloading on frequently visited sites, but over time the cache needs to be cleared out. I've seen browsers run slow as molasses, then absolutely zip after the cache was cleared. Think of it like putting frequently used items on your desk. Speeds up your productivity -- until you get three feet worth of crap piled up.